We hope everyone is well! 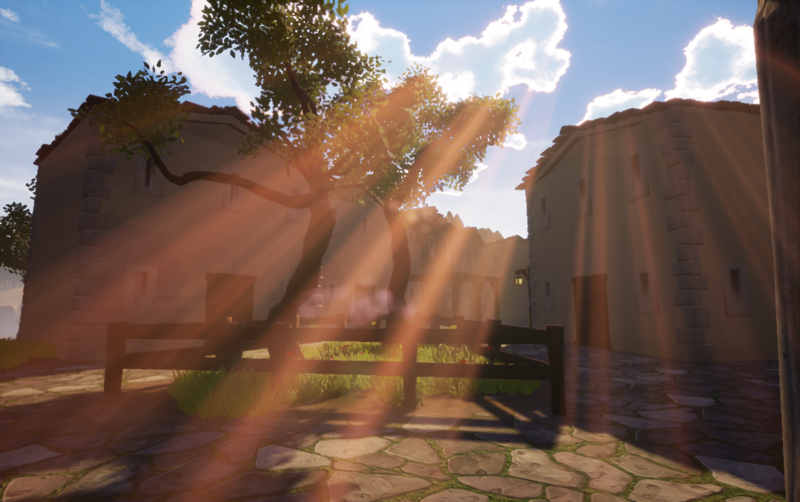 Over the past month, we've been working hard on implementing new assets and a new look for the village! We've placed everything and now it's just a case of playing through the level with the missions to make sure they work! It's a fun time right now because we can all see everything coming together. We'll be showing the other levels like the Ruins and the cave in the next update, so stay tuned! Right now we're adding a splash of colour to the village. We've been working on making the village still feel old with crumbling paint and the stonework showing through. There's still a lot of work to be done on this but we feel this is going in the right direction, it just might take some time to go through all the houses in the village to do this! 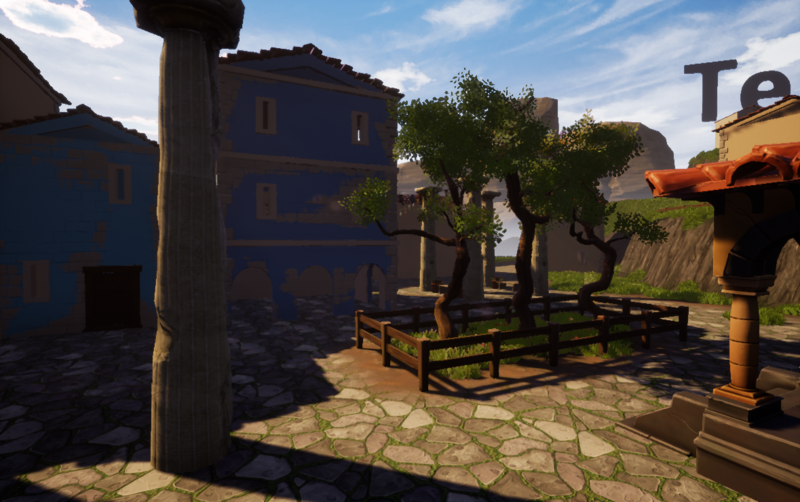 To find out how we do this in Unreal Engine, take a look here. It's pretty simple, we use vertex painting and it's brilliant for this stuff. 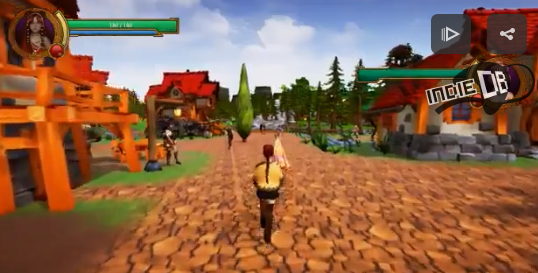 Our next step now we have the village down, we'll be focusing on the outside of the village, so different landmarks the player will find of interest. We'll be looking into old Greek stories that we can use to inspire us, so if you guys have any cool ideas, let us know in the comments! 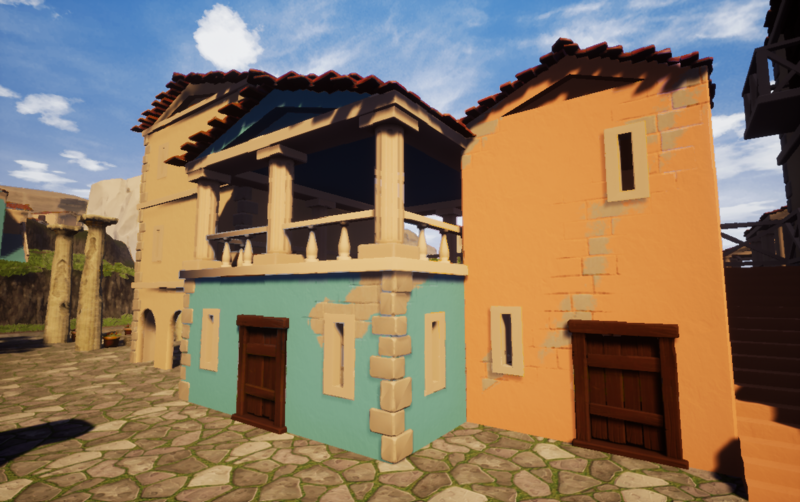 Pandora - Making the environment more Mediterranean and we're now on Steam! We've changed up our village to have a more Mediterranean feel to it. We've also added Pandora to Steam, so make sure you check it out! The year is 2018. Pandora has released and pig racing is now a phenomenon! Take a look at our newest video update. We have a big update! See new gameplay, a new landscape and the brand new features we've added in. Our plan on where we're heading with gameplay mechanics. This game looks really interesting, I can't wait to see more demos you release. The animation for the main character when she runs...I don't know what 3D program you're using but there are lots of free resources on run and walk cycles, even right on youtube you could find and emulate. The legs look stiff, the arms look the same. I'm not quite sure what it is about it but this is just what I see immediately. Here's a problem, though, to keep in mind....You don't necessarily want a character's run to be copied directly from real life. It might be better to copy it right from real life, then modify it to be exaggerated. This is what for example a game like Final Fantasy 13, 14 or 15 does. 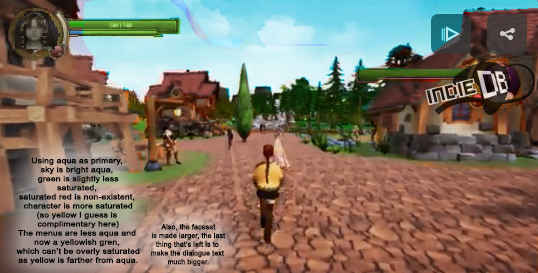 The text is far too small, so it turns the player off, at least that's my own perspective on it. Bigger text across more pages shouldn't be too hard to accomplish, right? I think this would be better. I would take the "Hera" text and position it in the middle of that buldge on the upper left of the text box, it looks like it's supposed to be there. Okay so for color theory....If you keep using all oversaturated colors it makes it seem more cartoony. The character on the road seems to blend too much in with the texture of the road. What you need to do then, PERHAPS, to get a very natural feel color wise is to use aqua as your base color that can be very saturated. This leave your bright orange overly saturated road on the opposite (almost) end of the color wheel. You need to take this saturated orange then in that case and unsaturate it. Not too much of course, but it would need to be a pretty greyish brown, orange would be almost non-existent unless you're using this as your complimentary color. You need to add the slightest mist for those far away trees, as the farther away you get the greyer/unsaturated everything is going to become. Things also become cooler farther away so mixing more blue in far away will give that natural feel that everyone is attracted to in mother nature. 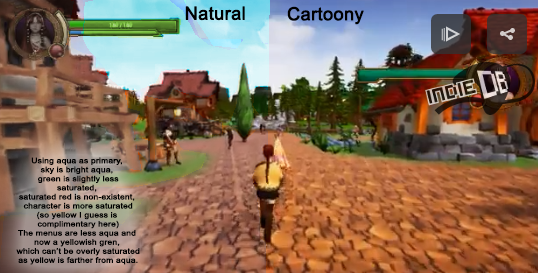 The mistake color wise that I see most game devs making when designing worlds I think is using an overly saturated green. If you want to use green as your super saturated color, then unsaturated the aqua sky enough to have an impact, but definitely don't shine bright red unless that is your only complimentary color. I guess those are overly strict rules though, and if your goal is to make it cartoony-like rather than anime-like it's fine. The appeal of anime, though, is that it seems to make sure of aqua as it's primary color, so that is the only color that has the ability to be very saturated. Hey, thanks for taking the time to write all of this! It looks like we hadn't updated the images and videos, so we've done that now. Why don't you take a look and see what you think of the updated versions? Feedback like you've done now would be amazing! I reaaaaally think you guys need to update that running animation, it looks terribly floaty. Other than that, this is beautiful, i'd love to see how it evolves. Any news regarding publisher or crowdfunding? And happy new year and good work! Yes something we're now currently addressing with the run animation. Hopefully, we'll have it fixed for the next build! We don't have any help, but I am looking at any financial help we can get to help tide us over. Been following for a lil while now and any plans for crowdfunding or something else? With what you have to show, and I'm sure in the future even more I believe it could be pretty successful and help further game development. We are currently making the demo to pitch to publishers. If that doesn't work, we'll go the crowdfunding route.